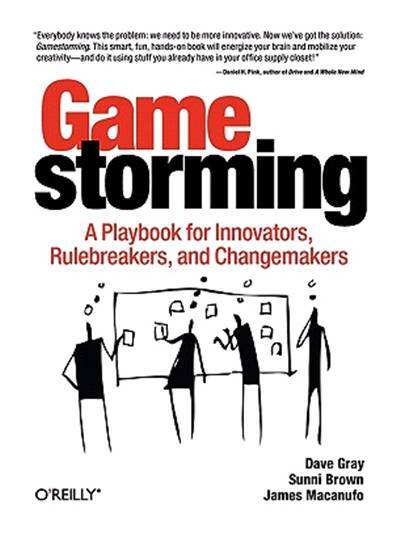 Gamestorming, a playbook for innovators, rulebreakers and changemakers by Dave Gray, Sunni Brown and James Macanufo is a great composition of a number of games and techniques out there to reach collaborative and innovative outcomes; well worthy of a read for all Agile coaches. The form, for the most part of the book, describes the game, the objective, number of players, duration of play, rules, the strategy for facilitating it and kudos to the originator of the game. Page 21: Every time I group a set of like themed post-it notes on a wall it actually has a term – ‘affinity mapping’, go figure. Page 39: The airplane metaphor. This reminded me somewhat of the sailboat retrospective technique. The back of the plan is ‘where we come from’, the port holes ‘who do we deliver value to’, the propellers ‘what gives us the power’, the cockpit ‘how do we steer’ and the horizon or front of the plane is ‘where are we going’. Page 65: Empathy map. I actually just appreciated being reminded about this fantastic idea from XPlane. Furthermore I had the fun opportunity to put it into action today which for the most part I felt worked well for the workshop I was in. Looking at the Anti-Problem (on page 80) made me wonder if these two techniques could be effectively applied to demonstrate a customer view/perspective that you want to avoid. Page 113: Pie chart agendas. I hate writing agendas with a passion (the ultimate waste – documentation of a future waste event), but the option to demonstrate in a visual format how much time is being spent on particular activities is a creative approach that might have me doing them with a little more motivation. The full circle of the pie is the total time of the meeting, you basically slice it up into pie pieces of the time proportionately you will be taking for each topic. Page 131: Trading card avatars. Used as an icebreaker this game has the added boon of also generating avatars for the story wall. Basically each person creates their own trading card with a hand drawn picture of themselves, their nickname and little known facts. If you are new to facilitating, Agile coaching or Scrum Master then I would definitely recommend taking a look at this book.